I am always intrigued whenever I see the all the blogging ingredient challenges. When I saw C.G. 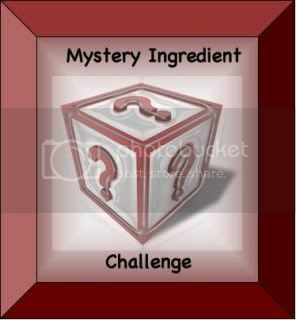 Foodie post this crazy Mystery Ingredient Challenge, I knew I had to participate. 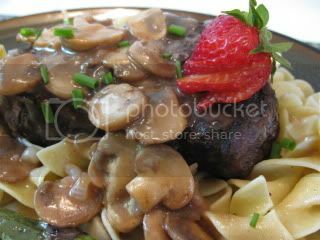 The ingredients for June were Filet Mignon, Egg Noodles & Strawberries ~ and they ALL have to be used in the MAIN dish! 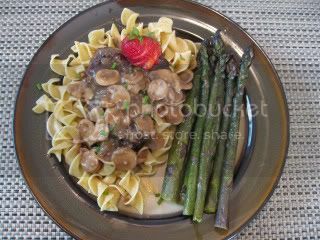 I instantly had ideas of ALL The Husband’s favorite things….Filet Mignon with a Marsala Mushroom Sauce and Buttered Egg Noodles. I reviewed all my favorite recipes that use these ingredients and came up with this. Heat butter and olive oil in a large skillet over medium high heat. Season filets generously with sea salt and freshly ground pepper on both sides. Combine the beef broth though shallots in a bowl and set aside. 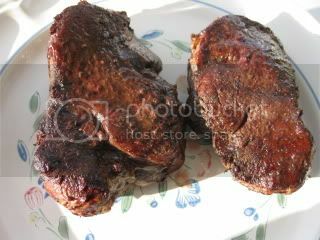 Add steaks to pan; cook 5 minutes on each side or until desired degree of doneness. Remove steaks from pan. If your steaks are not done enough, you can move them to the grill to continue the slow and low process of cooking them to medium well. You could do this in the oven. We cooked ours to medium well ~ 30 minutes slowly on the grill. Add mushrooms and thyme to the pan, and cook 3 minutes or until lightly browned. Remove mushrooms the from pan. Remove pan from heat; add Marsala, scraping the pan to loosen browned bits (this is where all your flavor is). Reduce heat to medium. Return pan to heat. 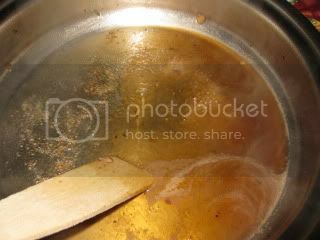 Add broth mixture to pan; bring to a boil. Cook 1 minute, stirring frequently. Stir in mushrooms. 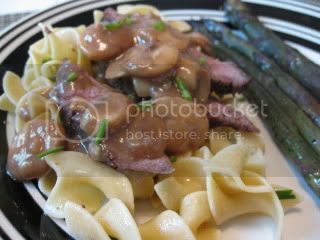 Serve sauce over steaks and Chive Buttered Egg Noodles. Here are the step by step pictures to show you how to recreate this recipe yourself. You can click any of the images to make them BIGGER. Preheat your skillet, season your steaks and brown them in your pan. Remove the steaks and place them on the grill to cook slow and low over medium heat. 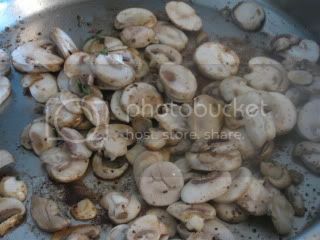 Add the mushrooms & thyme to your pan and cook for 3 minutes or until browned. Remove your pan from the heat and deglaze with your marsala wine sauce. Return to heat and add your beef broth sauce that includes your "secret ingredient" ~ Strawberries! 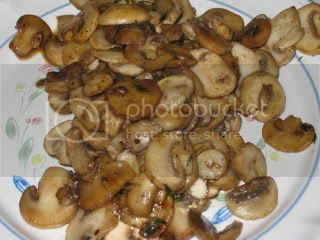 Return the mushrooms to the pan and cook for 1 minute stirring frequently. Remove your steaks from the grill and let them rest for 5 minutes before assembling. These are so simple to make. Simply prepare your noodles according to the package directions. 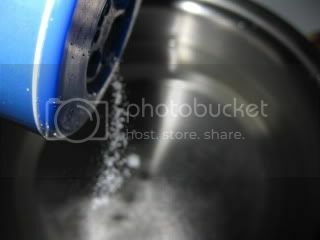 Be sure to add salt to your water as this is the only time you can actually get the "salt" into your noodles. 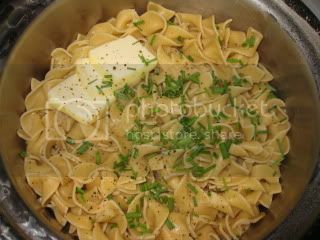 Drain your noodles and top with 1/2 Tbsp Butter (if using 1/2 a package) or 3 Tbsp butter (if using the entire package) and a few chives, cut into pieces with your kitchen shears. Mix it all together and you are good to go! 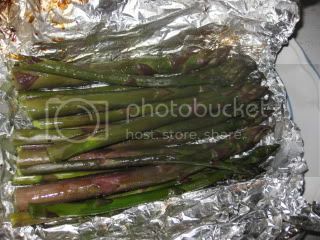 As a final addition to our meal, I threw some super cool Purple Asparagus on the grill with a little olive oil, sea salt and pepper to cook along with the steaks (about 10-15 minutes). I LOVE how purple it is but it cooks green! Now it’s time to put it all together! 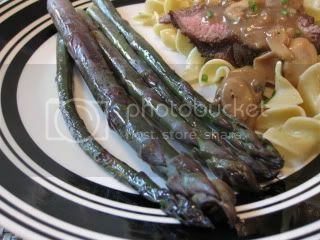 Place your chive noodles on the bottom with a side of asparagus. 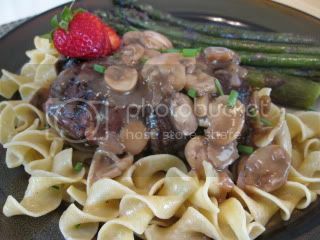 Top your noodles with your filet and strawberry marsala mushroom sauce plus additional chives. Enjoy! 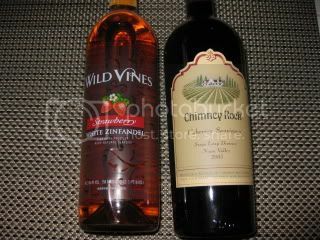 You could serve this up with a Fabuloous Strawberry Zinfandel if you wanted to keep the strawbery theme or my personal favorite Chimeny Rock Cabernet Sauvignon Red! Ok, ok….I didn’t eat that Gigantic Portion ~ That was The Husband’s….Here is my serving! Not to toot my own horn or anything, but, I seriously impressed myself with this meal. 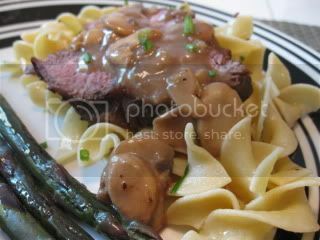 The sauce was amazing ~ It was creamy like a rich dish with a slight sweetness from the berries and marsala wine then you get a little kick of savory from thyme with the rich buttery noodles. The best part about it is that there is NO cream ~ it’s a healthy spin on an normally fattening dish. You gotta LOVE that! SAVE THIS RECIPE TO YOUR COLLECTION BY SpringingIt! Ok, That’s it! Did you survive reading ALL that? ~ Whatcha think?! Does it look like a dish you’d try and like? Feel free to be 100% honest! « A fun day of eats & treats! This looks delicious. I usually am not a steak lover but just tried filet mignon again the other night and loved it. Thanks for the recipes and the wine pairing suggestions. This looks awesome! We love trying not so normal ingredients with basic recipes, and I think this sounds awesome – especially now with all the fresh strawberries coming in! Great idea! 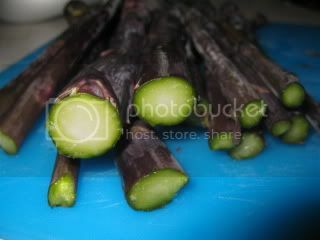 Purple veggies!! Woohoo!! That sauce sounds really good! wow. bookmarked. another amazing creation from danica's kitchen! Brandi ~ Thanks – do tell if you try it out. I'd LOVE to know your thoughts. 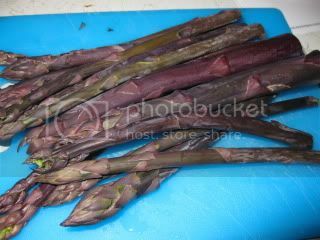 K ~ I totally thought of you when I bought the purple asparagus. Jess ~ You were supposed to stop by for dinner…oh wait, you are not in cali anymore 😀 LOL…. This is a FABULOUS recipe!!!!! Yum! 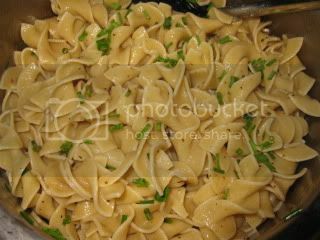 Chow and Chatter ~ Thanks – it is surpisingly easy to make and healthified too!